A Bill providing for setting up a regulator for the real estate sector and having provisions like a jail term of up to three years for developers issuing misleading advertisements about their projects repeatedly was approved by the government today. In a move that will improve the sentiment of foreign investors, the Cabinet on Tuesday approved a proposal for non-binding conciliation with Vodafone in its Rs 11,000-crore tax liability case when it acquired Hutchison assets in India. 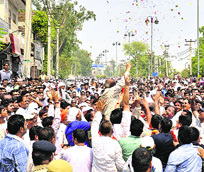 As many as 103 Independent candidates out of a total of 144, a majority of them owing allegiance to the ruling Congress, emerged victorious in the election to the seven municipal corporations, results of which were declared here today. Major political parties today protested the decision of the Central Information Commission (CIC) to bring them under the ambit of Right to Information Act with the Congress and the Left parties questioning the move while the BJP taking a divergent stand. The Delhi Police today said the crime syndicate run by Dawood Ibrahim and his key henchman Chhota Shakeel was behind the IPL spot-fixing scandal. All 26 accused arrested in the case were allegedly connected in one way or the other to this syndicate, it said. Actress Jiah Khan committed suicide late Monday night by hanging herself at her home in Juhu, the police said. She was 25. Jiah, officially named Nafisa, was found hanging from the ceiling fan of her home at her flat in the Sagar Sangeet building by her mother Rabiya. The SGPC has deposited a court fee of Rs 10 crore in the 28-year-old legal battle seeking Rs 1,000 crore in compensation from the Union Government for the damages caused to the Golden Temple during the 1984 Operation Bluestar.